Celebrate the Grand Sport heritage with our precut Fender Hash Mark graphic kit that's sized and fit close to the original factory kit. GM's part number for the kit (10279781) has been discontinued. When an active item, it listed for $39.57 and was only available for the Left Fender in Red. Available here in a wide variety of colors, we offer not only the Left graphic but the Right as well. 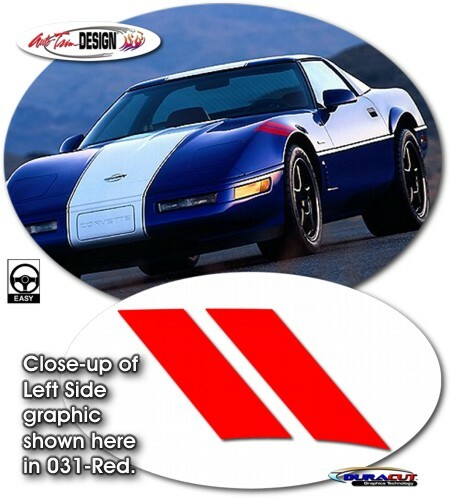 Graphic kit is specifically precut and fit for all '84-'96 Chevrolet Corvette C4 models and will not fit any other vehicle. In our opinion, Red is the closest match to the discontinued factory graphic. Installation Tip: Leading tip of Hash Mark fits best approximately 18.875" (47.94cm) from front edge of Hood.